What is distinct in this dish is the taste of the most expensive spice in the world–saffron. In Aden this is a dish we usually make for special occasions–weddings and special guest. It is usually made with lamb but I have tried it with chicken and it turns out just as good. You have to be generous with the spices for this dish to turn out aromatic. 16) 1/4 of tsp of food coloring (orange)–half of which we will sprinkle on the rice. The night before you intend to make this dish, marinate the lamb and patatoes in ingredients 9-19 +lemon juice + balsamic vinegar + olive oil . Deep fry the onions after coating them with flour, and add half of it to the marinated lamb mixture for flavor. Place in an oven stoneware dish or pyrex (enough to accomodate the meat and 3 cups of half boiled rice) and refrigerate. 3 hours before your guests come, add 1 cup of water to the marinated lamb and cover (either with its lid or with foil. Place in a 350 F preheated oven for 2 hours, or until the lamb is tender. Make sure it does not dry out–if you feel it will then reduce the temperature to 300 F.
Boil some water with salt, a few peppercorns, cardamon pods, and sticks of cinnamon. Boil the rice until it is almost done. Drain the rice and leave aside. When the lamb and patatoes are cooked through layer the rice on top. Sprinkle the rest of the saffron and food coloring. A little water–about a 1/4 of a cup evenly sprinkled. Distribute the rest of the fried onion on top of the rice and OPTIONAL : Take a piece of natural coal –about the size of a nickel or quarter. Light it up, and place in a nest made of the outer and first inner layer of an onion. Place in the middle of the pot , add a few drops of oil to the coal and cover and let the smoke permeate the dish. It will give it a nice smoky flavor. Then cook in the oven at 300 F for another hour–or until the rice is cooked through. OPTIONAL : I like to add three dabs of butter or aromatic ghee on the face [surface] of the rice. It gives it an extra special aroma and taste. We usually serve this dish with pickled lemons in red chillie sauce and with yoghurt on the side. I used the leg. Why does it come out dry I wonder–insha Allah if you follow these steps it won’t turn out dry. Insha Allah let me know how it turns out. Make sure that the sauce around the lamb is not too thick, add a little water to it if it is. Also cover the lamb, potatoes and herbs [add a little water] while it cooks. And the rice should be half cooked, so it does not have to stay in the oven long and dry out the meat before it is done. Hope this helps. Insha’allah I will be making this dish (recipe) soon. Please clarify for me what ingredients do we use to marinate the meat and also what temperature do we set the oven at when we bake the rice and meat together? I appreciate your help. Thank you very much for your prompt response and help. I will let you know how it turns out (I’m sure it will come out superb, as your other recipes have). I will try to post a pic as well :-) Thanks again. Are the onions Deep fried? I plan on making this dish for New Years Day for my family (finally) and look very forward to it. I did notice though that the ingredients number 17-18 are missing. Can you please clarify :-) Thank you. I can’t access the post with the limited wifi access I have , can you tell me what the two ingredients are and I’ll tell you what to do with them insha Allah . Sister Nowal–Do you see it now? I fixed it. Yes, it was just a mistake in the numbering. Thanks for letting me know. Let me know if it still does not make sense. What kind of flour do u use to fry the onions? Thanks. Can I use heckers or aunt jemima? Do I deep fry the onions? Salam :) if I make four pounds of lamb do I have 4x the ingredients? Salaam — yeah I would do that . Thank u :) also when I actually pop the meat into the oven, should I put 4 cups of water before cooking it? I would add 3 just so that it is not too much. But eyeball enough water to cook the meat and form a thick sauce. Enough not to cause the meat to dry out Insha Allah. I coated the onions with flour, when I put them in oil the flour didn’t stick on the onions. Was I suppose to add an egg or something? No, no egg. Strange. I cut the onions right then and there and then coat immediately. Did you let the onions dry of their natural moisture before you did this? If so then yes they won’t stick. Also, they don’t need to be completely coated, just a dusting will do to help them brown and maintain their shape and not stick together. Hope that makes sense. Thanks Samira ! Nice to meet you. We do that as well :) Insha Allah will include it in thr recipe :) love it! I am sure it looked good Maa Sha Allah :) Yes, there should be a little broth, but not too much. I should put that in the recipe. This is why i love it when you all comment, you make me pay attention to things i normally wouldn’t having made a dish over and over and over. Thank you for your quick response. in sha Allah next time it’ll work like you say. perhaps i added too much water in the beginning because i had doubled the quantities and so water as well. Salaams, should you still cook the meat for 2 hours if it is chicken instead of lamb? Okay, insha’Allah chicken would take 45 minutes? Yes, probably it will depending on how big or small it is. But it sounds just about right. Barak Allahu Feek. Insha Allah it turns out excellent. Share how it turns out with us on the blog okay. Yes, I will let you know ukhti! It is for my mother’s birthday. Maa Sha Allah. She will love it. I always enjoy it, especially when my husband makes it for me. And when i make it, he has to say something like “Excellent you made it exactly like i do!” LOL! Did you put too much water Zainab or did not much of it evaporate to form a thick sauce after the meat cooked. Next time you want to either let it evaporate some or pour some away if there’s too much. The rest should be absorbed by the rice. So, i don’t know what went wrong there. As for the spices–the potency of spices differs. If you have had them for too long and they haven’t been stored correctly they must have lost their strength. Or maybe the quality. I buy my own, usually all whole, roast the cumin and coriander and grind on my own in small batches. I like it to be strong and fresh. Do the same with the pepper, and cinnamon and everything else i can. So, if you can do that it will come out great. I need to add a section here about spices insha Allah. Thanks for bringing it to my attention. Now when you feel that your spices are not strong, and you can’t smell them in your dish. Add more. Okay. Hi, can you please tell me what is the difference between zurbiyaan, biryani, and kabsa? Thank you. 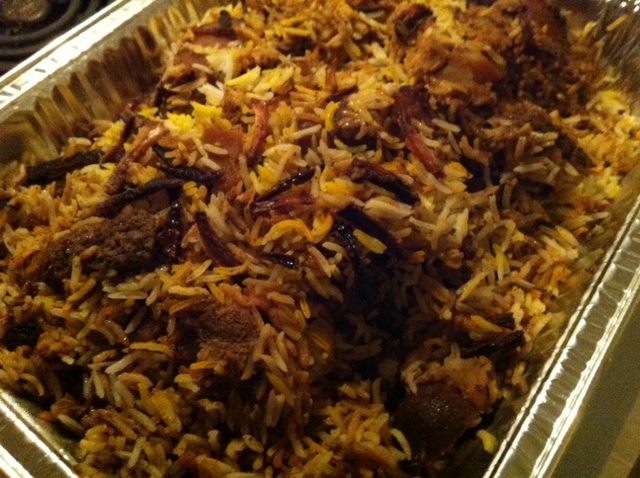 Zurbiyan is the name of a particular kind of dish with lamb , rice and more importantly saffron that we make in Aden. It’s a dish that we make for special occasions like: weddings, Eids, and Fridays when family gather. Kabsah is he name of any dish that involves meat and rice being cooked together. It is not just used in Yemen but it is use all over the Arab World. For some Zurbiyan is also called Kabsah, but we in Aden don’t call it that. Biryani is the Indian word for Kabsah, and usually involves for Adenis more spices that usually used, and more in imitation of Indian rice and meat recipes. Hi Lamya, thank you so much for this explanation and it really helps. Do u marinate the lamb with the peppercorns, cinnamon sticks and cardamom or is that for the rice? Sorry for asking so many questions, one last question…is the food coloring liquid of powder? No problem. Ask away! It is powder. I usually go to the Indian grocery store and buy theirs. Also if I just make it with meat and no potatoes should I still put in 1 cup of water? I add them to both Yasmine. It will comfortably feed 6 , if you make nothing else. But it will feed more if you serve other food items. Usually when we make this dish this is the only thing we eat. We just serve a salad and condiments with it.